In the course of my 60 years in the autograph industry, I have been very active. I have been a member of all the major hobby related organizations including Gold Coast Autograph Collector's Club, the original International Autograph Collector's Club and Dealer's Alliance, the Manuscript Society, F.A.C.E. 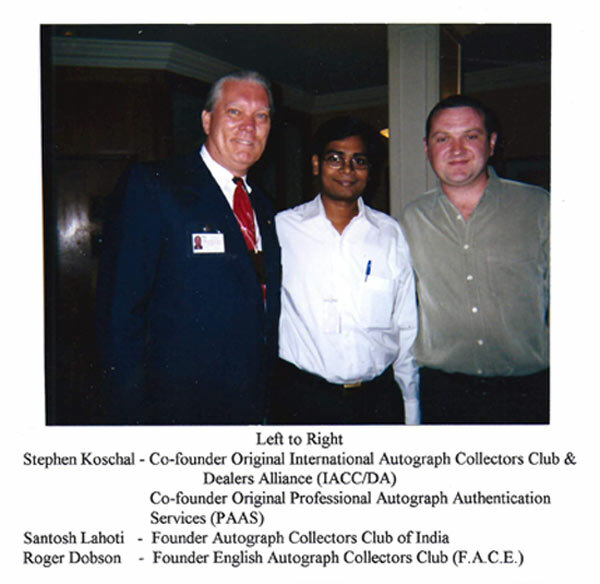 (England), German Autograph Collectors Club (ada1986) and the Autograph Collector's Club of India. F or these organizations I have written hundreds of autograph related educational articles for their journals. I have written articles for magazines namely Autograph Times, Autograph Collector, Autograph Quarterly, Sports Collectors Digest and Autographensammler. I have also authored 13 books and signature studies on autographs many of which can be found on this web site. Continuing education is important to me. I was instrumental in creating the 14 different autograph educational courses taught in New York, Chicago, Los Angeles. Dallas, Miami, Ft. Lauderdale and Washington, DC. For a few of these courses I was also the instructor. I was the creator of the first Internet Autograph Educational Course of which hundreds of collectors and dealers successfully completed. I am the recipient of many awards from autograph organizations both here and abroad. Members of Compuserve voted me the "1994 Philographer of the Year." For many years I have worked with law enforcement. I have represented many collectors and dealers as an expert witness in civil courts around the United States. I was an expert witness representing the United States of America and the Federal Bureau of Investigation in Federal Court for "Operation Bullpen during 2003-2004". The forger, Steve Lyons went to prison based on my testimony. On behalf of the FBI, I thank you for your assistance in the investigation and prosecution of forger Steve Lyons, one of the convicted subjects in the FBI's Operation Bullpen case. The hours you spent working with Special Agent Timothy Fitzsimmons and Assistant United States Attorney Melanie Pierson were very helpful to the government's case. Your knowledge and professionalism resulted in Judge Jeffrey T. Miller accepting your trial testimony, after qualifying you as an expert witness in this matter. You should know that in the recent sentencing of Steve Lyons, Judge Miller singled out your expert testimony as very illuminating. In describing the overwhelming evidence against Lyons, Miller noted that even without Lyon's recorded conversations, the government presented a clear case that was clarified through your testimony. Judge Miller ultimately sentenced Lyons to 36 months in federal prison. I also want to thank you for your continuing assistance to law enforcement in combating memorabilia fraud. I know you have assisted SA Fitzsimmons, as well as other agencies, on other matters and I encourage you to continue in this worthwhile endeavor. For years I was a very active member of the U.A.C.C. I participated in most of their events and was elected a Director by the membership. It wasn't until I became a club officer that I was able to attend closed meetings and understand what went on behind the scenes. At one point, as a Director, I had no choice but to file very serious ethics charges against the President of the Club. The club did not follow their own rules that are well documented in the club Constitution. The ethics board refused to act on the charges and would not even acknowledge receipt of my complaint. The complaint filed by me was done in good faith and in the overall best interest in the club and its future. I was told by a another Board member that I was not being a team player. For my well intentioned efforts, that same Board member decided to fabricate a list of sinuous complaints against me. I chose to no longer want to be associated with anything that even resembled this group. Afterwards, the club posted more ridiculous fabrications about me. However, they realized the err of their ways and deleted the story on their web site. Many collectors and dealers were horrified of the club's deceptive efforts. A huge percentage of collectors and dealers would not renew their membership. The UACC is now a shade of its former self. Since then, a club Director, directed by the club President, has asked me to rejoin the UACC. I have refused and will continue to do so as long as a handful of old dead wood remain in the drivers seat. The following is what the President of the U.A.C.C. had to say about me in writing. “...I want to thank you for doing so much to promote autograph collecting in general and the U.A.C.C. in particular....” March 3, 1993, Bob Erickson, President, U.A.C.C. Below, you will read statements, from another president of the U.A.C.C. who was a member of the Ethics Committee, a V/P of the U.A.C.C. and a Board Member. I have worked and helped the fraud division of eBay. In the past I have been asked to assist all the high profile companies who claim to authenticate autographs. I have also been asked to join their staff but refuse to do so. Because of all the mistakes made by all the authenticating companies, I simply can't afford to have my name placed on their Certificates of Authentication for items I would not see. The following is a partial grouping of assorted testimonials from both autograph collectors, dealers and autograph authenticators. "Stephen Koschal- one of the Founding Fathers of Modern Day Autograph Collecting.." Kevin Martin, Corona, Ca. "I have nothing but admiration for you Steve-- amazing things for sale, brilliant knowledge of the autograph industry. I consider you a pioneer in this field-- I have only been involved 5 or 6 years. Never met anyone as decent and versed as you in this hobby/industry. Always a pleasure to speak with!!! "..............................................Chris Carrington, Ct.
"You're a good man...a gentleman and a scholar." "Stephen Koschal is a legend in the world of autographs! Highest integrity! Richard Payne, Duluth, Ga"
"...I just wanted you to know I congratulate you on your win. I voted for you! ...I was so disgruntled with Herman (Darvick) I chose not to run for V.P. again...I'm glad to see you back.." .............................Paul Carr, Maryland, V/P, U.A.C.C. "...this I will press on our members and committee all the UACC not just the UACC UK, Even Bob Erickson (President UACC) agrees with me and it was he who suggested that I ask you to rejoin theUACC..."................... Roy Deeley, Director UACC. "...formally express our firm's sincere appreciation, and the appreciation of our client, Bill Miller on whose behalf you testified in the recent case against Collectors Universe, Inc. The jury returned a verdict in Bill's favor, in large part due to your testimony explaining the inner workings of the autograph authentication industry. It was quite telling that after I finished my direct examination of you, Collectors Universe's lawyers chose not to ask you one question on cross examination. If we ever need to retain an expert witness in the field of autograph authentication, you will be our first choice..."
"..thank you very much for the interesting and informative signature study of my signature. I am most grateful for an excellent analysis. I will look into the franking signature situation..." Gerald R. Ford, President of the United States. "...my best regards to a great friend and mentor in the art of book collecting..."
"...it is obvious that you are in the right field and I appreciate having the benefit of your talents..."
"...I write a bi-monthly column on books for a local Oregon newspaper, and would like to note this as one of the best Hoover pieces, but would first like an affirmation from an expert like yourself..."
"...I received the Trump book and I have already read it! I think you have made a very deep research, the world of collectors could be thankful to you. Many times I have seen preprint signatures considered as genuine by official writing authenticators. In this industry, you need to be an autograph expert, not just a writing expert. You need to know the habits of the celebrity. Thank you again for your book and I hope to meet you one time!..." "...because you have my utmost confidence and respect in your judgment pertaining to the value of precious books and collections, I thought I might impose on our friendship a bit and ask you if you would consider..."
"...as I reflect over the years that God has given me, I am thankful for all the blessings that have come my way. Certainly I count you in that number!" "...Steve Koschal, has discovered that there is quite a market for Ronnie Biggs autographs. Steve is an autograph expert..." .......Ronnie Biggs, Brazil, quote from his book "Odd Man Out, My Life On The Loose And The Truth About The Great Train Robbery. ........................................Bill Butts, Main Street Fine Books & Manuscripts. "I told ____at ____ that I was concerned about the autographs being authentic. I agreed to pay for an independent authentication____said he would reimburse me if they were not authentic. I told ____ I thought you (Steve Koschal) was the best authenticator to get a professional opinion. He said OK". T.H., S.C.
"Great Book (Signature Study of President Donald Trump). You have also cleverly left the field open for you to write a sequel after his presidency". B.G., N.Y.
“...Steve, glad to see someone honest has gotten into the business of autograph authentication.."
"In the December 23, 2005, Sports Collectors Digest, autograph dealer Stephen Koschal offers his thoughts on provenance. Koschal, who is generally considered the nation's leading authority on presidential autographs, states:..." .......................................................................Ron Keurajian, Michigan, Baseball Hall of Fame Autograph Expert, Author of Baseball Hall of Fame Autographs, A Reference Guide, 2012. "...I have tremendous respect for your knowledge..."
"Thank you for undertaking this work. I'm very appreciative that you are willing to share your lifetime of experience with me." ................................... Bill Scheffler, CT & CA. "I personally think you are the best in the industry. I recommend you every chance I have the opportunity to do so. You bring Brilliance to the industry. You have contributed more to the autograph community than anyone in the industry."